Richard Linklater’s popularity has increased a lot since he released his last film, Boyhood (2014), which drew on a normal child’s boyhood and teenage years, following the protagonist’s real growth and mixing it with a fictional plot. 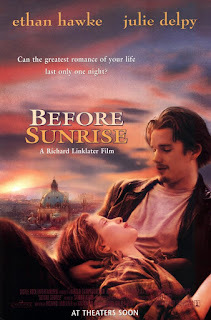 In Before Sunrise (1995), another of his films, we also find this eternal sense that can only be achieved by waiting for the film to be made by itself with contingent facts as facial changes or personal feelings. Watching Boyhood, we see a sort of complicity between actors and director; this gives a special value to the film. As we watch the rest of Linklater’s filmography, we see this complicity was materialized in other works. In Before Sunrise —whose screenwriters are Linklater himself and Kim Krizan— there’s another complicity that appears before we discover what makes it such a thought-provoking and poetic film: it’s the one that exists between Jesse (Ethan Hawke) and Céline (Julie Delpy), two youngsters who travel on the same train, from different departure points to Vienna —in his case— and Paris —in her case—. They get to know each other by simply starting to talk and deciding to go to have lunch in the train restaurant. Things will get crazy when they both start to feel something that can’t be described, in the beginning, as love; it is more banal, more informal and cheekier. They share an intense intuition that leads them to ask themselves: «Why do we have to separate from each other if we want to keep in touch? » They think that they have the opportunity to do something more transcendental than what they would normally do after leaving the train station: they can live an authentic experience. So, when they arrive in Vienna, Jesse offers Céline to get off with him and start walking around the city like lost tourists. Although it could sound too incredible, Céline doesn’t refuse Jesse’s suggestion and starts a brief new life that will stay alive just until she catches the next train, which will leave the next morning. We can be sure that, behind Austrian scenario, there is a hard work from actors and director trying to know each other and, in this way, getting a true knowledge of how it is to discover someone —or I should say Someone; it is clear that Céline represents a secret to be revealed for Jesse, and that it is a mutual impression—. This lovely message sent to spectators about the importance of letting ourselves escape to unknown realities, can also be read as an invitation to preserve magic moments and not to try to expand them or, on the contrary, oppress them. Frames used in Before Sunrise —generally long shots and full shots— reaffirm this idea of a fantastic world, Vienna, which disappears from one time to another. We aren’t very used to watching films like the Linklater ones; they can’t be classified in a specific genre or an obvious auteur style. One of the only things we can say about the filmmaker without hesitating is that he is a poet. What differentiates him from other poets is that, in cinema, he must work with others and persuade actors of his vision on topics such as the characteristics of young love or a spontaneous desire to reach an intimate truth.